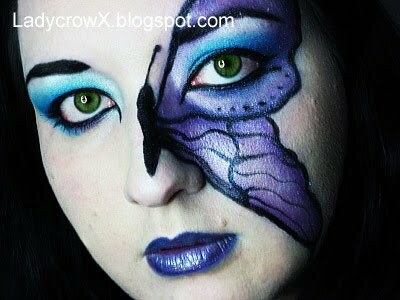 I have a bunch of pictures of looks I did....I'll have to post them...here's one I had done for a contest from Xsparkage....I have no idea where my video went for it. I adjusted the shadow/highlight on this because it was kind of dark. I did this one ages ago....around the first 6 months after I got into makeup....took forever it seems to do it lol. I did this one for another contest....too bad I was too busy to actually submit it. 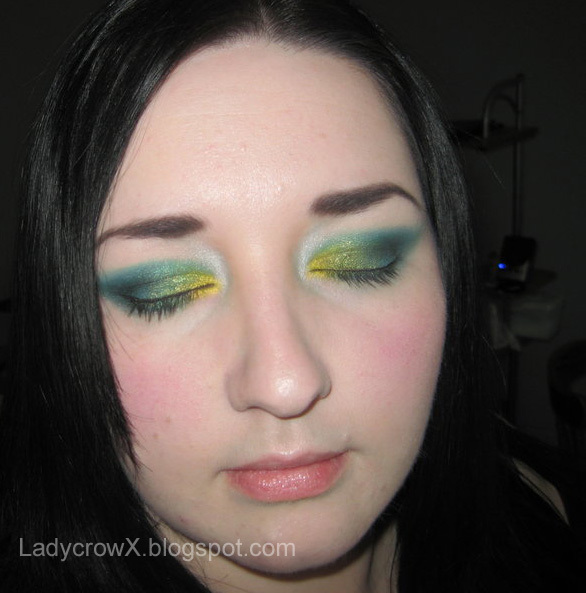 :( I had fun doing the pink/blue....blues are my favorite colors although purples go best with my green eyes. I forgot what products I used besides the Urban Decay 24/7 eyeliner in Electric. This one I think I just did because I was going out....again no idea what I used.....although I did LOVE the way my lips look....I'm more of a bubble gum pink lip girl....or dark reds....black...uh...oh I'm not a pink kind of girl....I'm a whatever the heck I want to be.....I never say I'm goth....I never say I'm preppy....labels are dumb....people should do whatever they feel like with their looks/style....least that's how I see it. I will however say my hair usually is either blue, teal or purple...although for a bit I'm waiting on it to rest before I re-bleach it to dye it again. I also tend to lean more into *dark goth/punk looking clothes/hair/makeup/jewelry*....I swing back and forth through every kind of style...I love japanese anime.....so I can be anything lol. 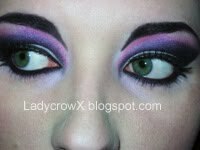 This one I again did for an "earlier in my makeup days" contest...I didn't win...but then again I did care/expect to. ;p I got the idea for the symbols from a game....who would of thought eh? 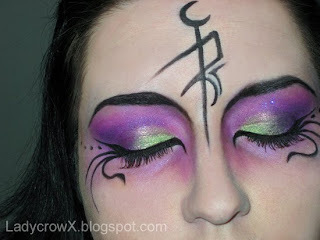 lol....I played a Witchelf in Warhammer Online and I loved her so much she "stealthed" into my makeup look. I used MAC Golder's Green pigment, a mix of Ben Nye colors and fluidline in Blacktrack....taken at night....(daylight is so much nicer to take photos in). This one I forgot what colors I even blended lol....I do know it looked way more vibrant/unique in person....I loved how it turned out and wish I could remember what I did for it. This is the last one for now....I have to dig up my other stuff....and I need to make some new ones when I get my Sugarpill palette and Fyrinnae haul....I also dared to order small samples of Archetype so I can see what the big deal is on those and the possible customer service issues.